The Eagle's staff in December 2016. The Eagle recently reached an important milestone: staff and alumni combined forces to create a $50,000 endowment through the University that will help fund important journalism at American University. 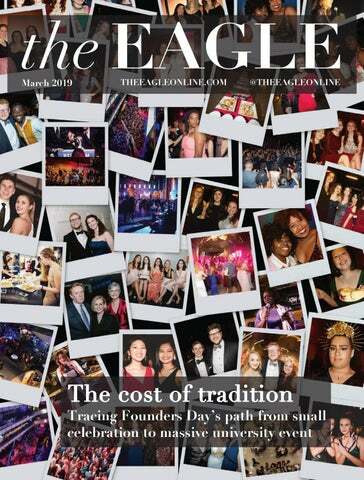 In 2012, the Eagle Advisory Board -- a group of students, journalists, professors and alumni of AU’s student newspaper -- under the direction of then-Chairman Brett Zongker, began fundraising for The Eagle Innovation Fund in the hopes of creating a sustainable pool of money from which The Eagle will benefit in the years to come. On Friday, AU’s Development Office told us that we had surpassed our $50,000 goal. Interest from that endowment once established will help pay for added tools and skills to thrive as a 21st-century newsroom, including equipment and digital training. It will supplement -- and not replace -- funding from the student activity fee, which pays for the majority of The Eagle’s budget at this time. We could not be more grateful to the many donors who gave money, hosted events and spread the word about this important mission. Special thanks goes out to all of the alumni of The Eagle, especially those on The Eagle Advisory Board: Zongker, Chris Kain, David Aldridge, Kevin Bohn and Anne Godlasky. We’re excited to reach this important milestone, but there’s work yet to be done. This fund will only continue to grow with additional support from across the AU community, and additional gifts to the fund each year can expand what it can accomplish. If you'd like to make a donation, go here. We look forward to continuing our support of The Eagle’s important work in informing the students, faculty and staff about their university.